First Floor Plan: 3x Bedrooms (Masters Bedroom en-suite with walk in closets), shared bathroom, pyjama lounge, double volumes, balconies, linen storage. In this home, you really feel like you’re in a trendy hotel suite! 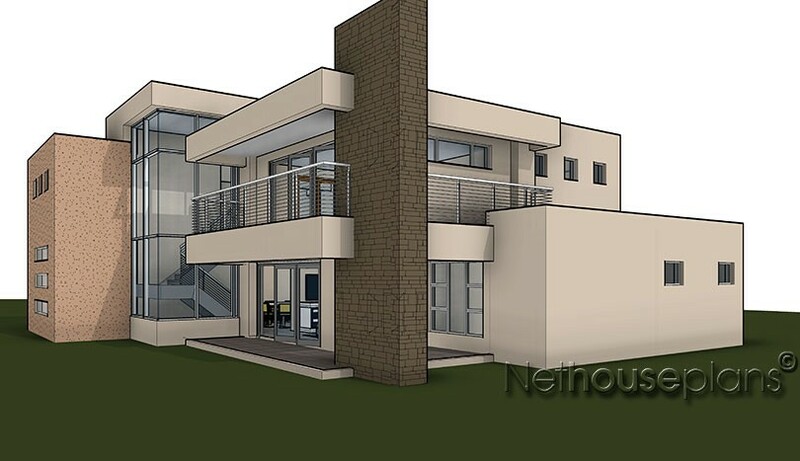 This 4 bedroom house plan in modern architecture design, demonstrates the best way to increase airiness and high-class features in an efficient mid-sized floor plan. 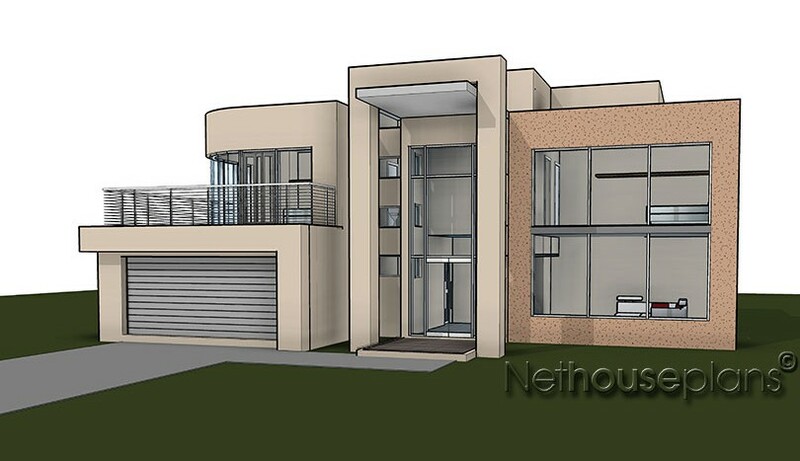 This is a stylistic modern 4 Bedroom House Plan features a large expanse of glass and symmetrical cantilevered block facades that conveniently compliments it’s flat roof form. The double garage features a bulging form above the garage door with a curved modern stainless balustrade on the balcony above. 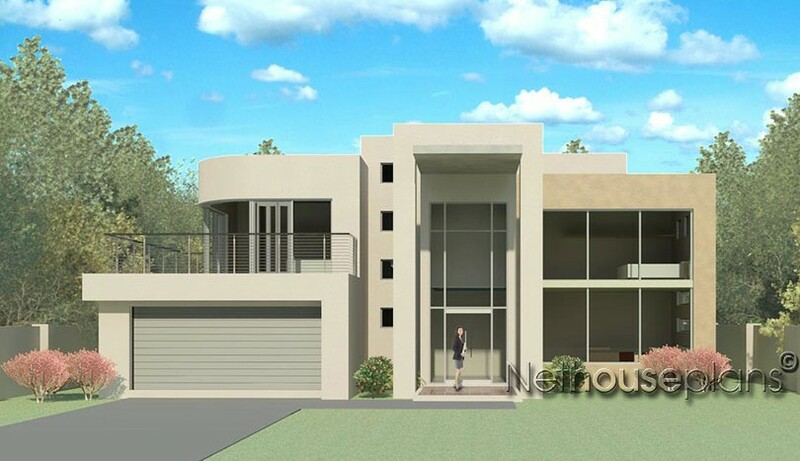 This modern floor plan is approached via a stylish entry porch and is entered through a dramatic 5m high front door, revealing a well-appointed double volume entrance hall. The main entrance door is nestled to the expansive curtain wall. Most of the interior living areas look out to the swimming pool area through large sliding folding doors. 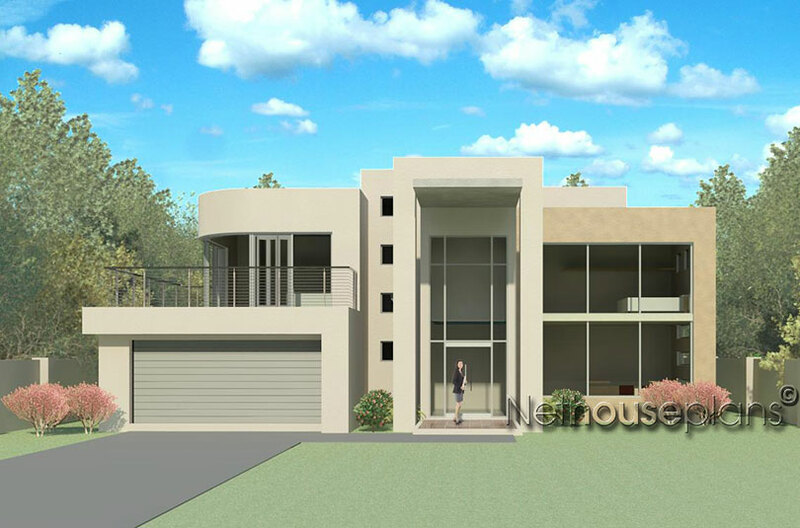 The openness of this 4 Bedroom House Plan provides the experience of outdoor/indoor living without the compromise of privacy. 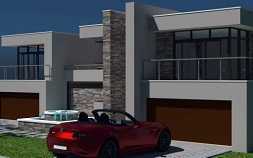 Inside the ground floor of this two storey, 4 Bedroom house plan is an exciting floor layout for today’s lifestyle. 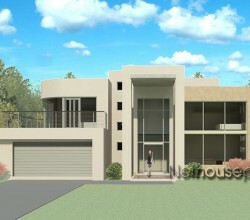 The inviting entrance hall takes you into the spacious lounge and dining room. The family room is located adjacent the dining room and leads to an open patio. A U-shaped kitchen and scullery are well located next to the rear courtyard areas. The guest bedroom suite is situated towards the back of the house to ensure maximum privacy to its occupants. 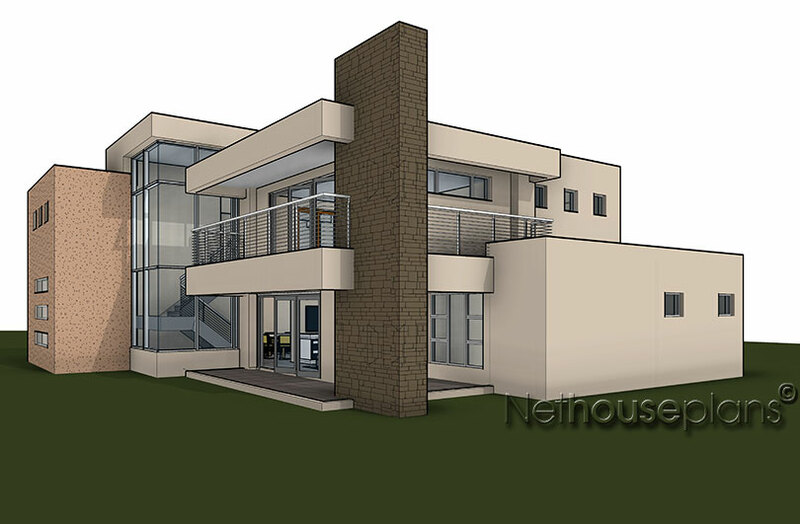 A staff room with a bathroom is also located at the rear of this modern home with access via the scullery door. Upstairs the master bedroom has a walk in closet and a private recessed bathroom. The two additional bedrooms have ample cupboard space and share a conveniently situated full bathroom. All bedrooms has access to a balcony. 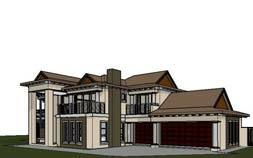 A truly modern 4 Bedroom House Plan.